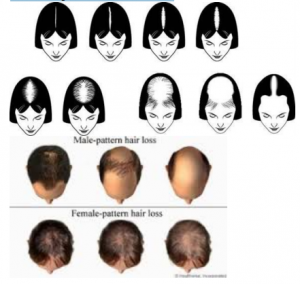 Androgenetic alopecia is the most common type of progressive hair loss. It is also known as male pattern baldness, female pattern baldness, or just common baldness. It affects about 50% of men over the age of 50, and about 50% of women over the age of 65. In women the severity varies, it may present as widespread hair thinning but in some cases it can lead to complete baldness. Yes. It is believed that genetic susceptibility to this condition can be inherited from either or both parents. What are the symptoms of androgenetic alopecia? Androgenetic alopecia affects men earlier, and more commonly, than women. 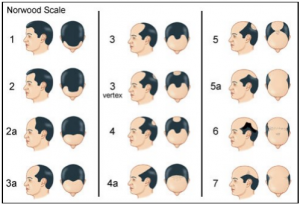 Males typically become aware of scalp hair loss or a receding hairline, beginning at any time after puberty. In women, the age of onset is later compared to men, usually occurring in the 50s or 60s. Occasionally, androgenetic alopecia in Women may start earlier than this, in the 30s or 40s. In some women, this condition can be associated with an excess of male hormones such as in polycystic ovary syndrome (PCOS). Acne, increased facial hair, irregular periods and infertility are all signs of PCOS. Androgenetic alopecia looks different in males and females. areas, before they become absent. 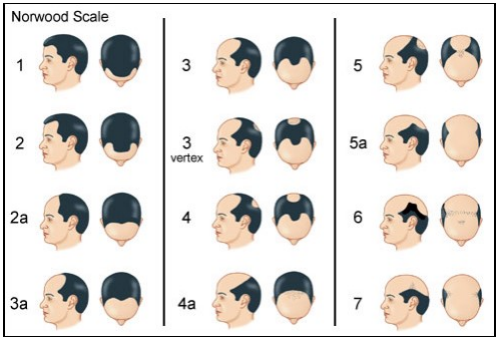 In men, the usual pattern of hair loss is a receding hairline, and loss of hair from the top and the front of the head. In women, hair loss or thinning typically occurs at the crown of thescalp, with complete or nearly complete preservation of the frontal hairline. Licensed topical and oral treatments: Applying 2% or 5% minoxidil solution to the scalp may help to slow down the progression and partially restore hair in a small proportion of males and females. However, this product is expensive and seldom produces a worthwhile long-term improvement. In those who respond, the benefit is only maintained for as long as the treatment is used. Minoxidil has been known to cause irritant or allergic reactions at the site of application. For women, medications such as spironolactone, ciproterone acetate, flutamide and cimetidine can block the action of dihydrotestosterone on the scalp which may result in some improvement in hair loss. Spironolactone and ciproterone acetate however should be avoided in pregnancy since they can cause feminisation of a male foetus; both should be avoided during breast feeding. Flutamide carries a risk of damaging the liver. It is important to note that all of the topical and oral treatments only work for as long as the treatment is continued. Furthermore, none of these treatments are particularly effective. the condition in some individuals. These preparations however may wash away if the hair gets wet (i.e. rain, swimming, perspiration), and they only tend to last between brushing/shampooing. An important function of hair is to protect the scalp from sunlight; it is therefore important to protect any bald areas of your scalp from the sun to prevent sunburn and to reduce the chances of developing long-term sun damage. You should cover any bald patches with sunblock, your wig or a hat if you are going to be exposed to sunlight .